The Gene and Cell Therapy Lab (GCTL) provides translational researchers with the infrastructure, training, and technical expertise necessary to develop and manufacture gene-modified cells, vector production, and ex-vivo manipulation of cells for novel gene and cell therapy products. We facilitate translation of gene and cellular therapy research such as immunotherapy and stem cell therapy. We provide both manufacturing and regulatory support needed by clinical research investigators to navigate the challenges of Phase I/II clinical trials. To ensure patient safety and compliance with current Good Manufacturing Practices, we operate under a comprehensive Quality Assurance program. The GCTL is a 2,200 sq.ft clean room facility located in the UW TRU. It has four separate ISO class 7 BL2 suites (with two suites under negative pressure). 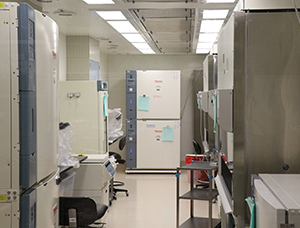 Each suite is equipped with biosafety cabinets, incubators, centrifuges and refrigerators. It has a CliniMACS® cell selection system for cell enrichment and /or cell depletion. The facility is also equipped with a controlled rate freezer and LN2 vapor storage system. The equipment is continuously monitored by a validated Reese Centron® monitoring system. The GCTL has manufactured clinical cell products for a number of diverse investigator INDs. A Phase I Study of HER-2/neu Specific T Cells in Patients with Advanced Stage HER-2/neu Expressing Cancers who Have Received a HER-2/neu Vaccine. Production and Testing of a new Lot of Bacteriophage PhiX174 antigen (FDA BBIND 714) for Clinical Use. We are a fee for service program. Investigators planning to use our services must work with the GCT Lab Manager to plan a budget for any grant proposal. 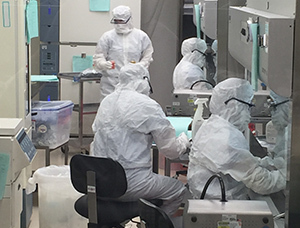 Manufacturing done in a cGMP-compliant clean room facility is decidedly more labor intensive and expensive than the preclinical bench top work. Hence, developing a protocol budget with the GCTL prior to submitting grant proposal is strongly recommended.